Welcome to Prepaid Phone News' continuously updated guide to the best deals in prepaid voice and text messaging plans. Last Updated: 6/27/18: LTE phomes now allowed on PagePlus Paygo. This post is for anyone who uses their phone for voice calls and text messaging only and doesn't need or want to pay for data. Some of the plans covered here do include data but it may be limited or overpriced. If you want to use even a little data along with your talking and texting see our companion post; The Best Deals On Prepaid Mobile Data. The cost of prepaid unlimited talk and text plans is now just $20/month on your choice of any of the four national networks (AT&T, Verizon, T-Mobile or Sprint) when you use a Mobile Virtual Network Operator (MVNO), a 3rd party company that resells one of the national operator's service. If you are ready to switch to prepaid or switch from one prepaid operator to another the first thing to do is check your coverage with all four national operators (AT&T, Verizon, Sprint and T-Mobile). All prepaid operators rely on one of the big four for their coverage. At the national level, AT&T and Verizon provide service in more places than T-Mobile and Sprint. But all four have areas that they don't cover. I've created a page showing the national coverage maps for all prepaid operators. It has links to each operator's detailed block by block maps. Rule out the networks that don't provide service where you live, work and play. Once you've found the networks that will work for you, check out my recommendations below to find the best deal for your usage on your preferred networks. Verizon: Over 1000 minutes plus texts per month, Red Pocket Amazon annual plan. ECO Mobile or Red Pocket $20 unlimited plans or Verizon $30 unlimited plan. 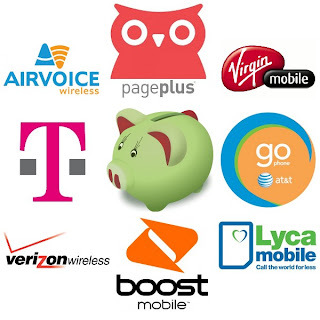 Under 1000, Expo Mobile Pay As You Go, Page Plus $12 Plan, Selectel $15 monthly plan or Best Cellular $15 or $19 plans. AT&T: Over 800 minutes plus texts per month, Airvoice Wireless, Red Pocket or EasyGo $20 or Cricket $30 unlimited plans. Under 800, Airvoice $10 Plan, H2O's Pay As You Go or Pure Talk $10 or $15 Simple Plan. T-Mobile: Over 1000 minutes plus texts per month, Ultra Mobile, Red Pocket or ECO Mobile $20 or MetroPCS $30 unlimited plans. Under 1000, SpeedTalk's Low Cost PayGo or Lycamobile Pay as You Go. Sprint: Over 1000 minutes plus texts per month, Tello's $11 or Red Pocket or ECO Mobile $20 unlimited plans or Boost's $35 unlimited plan. Under 1000, Tello, Expo Mobile or Real Mobile Pay As You Go. Cheapest may not always be best. With the exception of Airvoice and Book Mobile which offer excellent support, the low price leaders tend to have less than stellar customer service. There are other operators worthy on consideration. Compare them using the four tables below which list the best values in unlimited talk and text plans, pay as you go plans, non-unlimited monthly plans and unlimited text plans. In the tables, click the operator's name in the first column for PrepaidPhoneNews' coverage of that operator. Click the plan name in the second column to go directly to the operator's site. Except as noted, prices include all fees and taxes with the exception of applicable state sales tax and e911 fees in some states. 1 Ultra Mobile charges a "cost recovery fee" of 50¢ on airtime loads of $10 or less and $1 on airtime loads of $10.01 or more. 5 Airvoice - 50 MB of high speed data then 50 MB of throttled data. 2 Page Plus deducts a 50¢ maintenance fee from your balance each month. 3 Airvoice deducts a $1 maintenance/e911 fee from your balance each month. 4 Lyca's minimum top-up is $10. Funds do not expire but you must make a voice call, or send a message or use data or purchase a top-up at least every 90 days to retain service. The 1.33¢ minimum monthly cost is based on a one minute, 4¢ text every 90 days. 5 Real Pay As You plan costs $20 for 360 days of service. 6 Unused funds do not roll over. 7 Unused funds expire after the sixth rollover. 8 Tello airtime doesn't expire as long as call, text or surf the web at least once every three months. Tello's minimum top up is $10. Non-Unlimited Monthly Plans, can be a good choice for users with moderate needs that don't fit the pay as you go model. 1 Plus taxes and fees. 2 $9.95/month data and MMS addon provides 200 MMS and 400 MB of data. Also available: 1 GB/ 400 MMS for $19.90. Unused add-on data expires after 30 days. Unlimited Text Only Plans. If mostly text, with little or no talking, here are the least expensive unlimited text plans. 2 ChitChat adds $2.75 in taxes and fees to the monthly plan price. Thanks for the great summary of whats out there. The only one missing that I can see is Net10, I think they fit well into the 'moderate user' category (where I fit in too). They also finally offer an unlimited plan, so in months when I need a lot I can get it (like Christmas), but most months their $25 card is enough. Thanks for all the great info though, I feel like an educated consumer now. I never heard of Lightyear wireless so I looked at the site and I don't see the value. They use the Sprint Network but charge $5 - $10/month more than Sprint's own Boost Mobile and Virgin Mobile's unlimited plans, which have no "required State Tax fee" if you buy refills online. It's also sold as a multi level marketing "make money at home" type business. A web search turns up a lot of unhappy distributors who ended up losing money. I do not see the 6c per MB price on Airvoice 10 bucks plan. It's 0.33c per MB on their site. Update this... otherwise great. The Airvoice data rate was reduced to 6¢/MB late last month. The web site hasn't been updated yet. You can confirm the lower rate by calling Airvoice at 888-944-2355.
wow that summary is really helpful! so nice to be able to see waht is out there all in one snapshot. i have heard amazing stuff about straight talk- seems like page plus just beats them price wise but i only ever hear about straight talk. does anyone know what page plus are like? customer service wise etc? how do you choose between the two.. Page Plus definitely had some issues with customer service a few years ago, but the last time I dealt with them, they had improved quite a bit. They have many dealers, from the neighborhood wireless shop, to national dealers like Kitty Wireless. Once you are subscribed the service is pure gold, so if you are nervous about page plus customer support, go to a local dealer to sign up and let them interface with PP. PP will serve just about ANY CDMA phone, although, if yours is a make or model that they do not sell, you will be providing your own support on the instrument itself, but how smart do you have to be to use a telephone? Nice to know there are choices, but you really do need to do your homework. You need to pay close attention to the terms and policies of each company. Some have fees that are not disclosed to you upfront and you find out about them after the fact. This usually means you'll be paying more than you thought. As a "heavy user", I'm leaning toward straight talk, mostly because the have better phone selection, especially the smart phones. What I like about the prepaid option is that there is no contract, so if I change my mind, there is no cancellation fee. I think the only reason Straight Talk isn't listed in the best unlimited text section is because their unlimited text is offered in their complete unlimited package. Since leaving my contract carrier, I did do my homework and have found Straight Talk to be the best deal for me. Neither Page Plus or Straight Talk have great customer service, but what phone company does? Page Plus suffers from long wait times when calling. Some of their reps don't seem willing to help but others are great. I never call though. It's easier to use a good online Page Plus dealer like Kitty Wireless for activations and phone swaps, the website or automated 800 number to apply refill PINS and Page's online ticket system for issues with the service. I haven't used Straight Talk myself but I've heard that the reps are polite and answer the phone promptly but don't seem to have the authority or tools to fix technical or billing issues. Alice, GSM freedom is real. True, Metro PCS and Cricket allow some other operator's handsets, but only after they have been flashed which takes time and money. PagePlus doesn't require flashing but blocks some phones (Motorola E816, iPhone, Verizon prepaid models and until recently BlackBerrys). Straight Talk, Vergin and Verizon Inpluse do not allow any "foreign" phones. Swapping a CDMA phone also requires either logging into a web site or a CS interaction. GSM SIM swapping is user friendly and can be done in the field. Much better, IMHO. Do these tips apply to visitors from overseas coming for a month? We'll need a phone number but have a US phone (as well as a "foreign" one). What's the best deal for a number + prepaid plan? Any of the services and plans mentioned in this post can be used by international visitors. However, your best choices are probably T-Mobile or AT&T as these are GSM operators and you can just put their SIM in your unlocked phone. Please refer to my post US Prepaid GSM Voice, Text and Data Options For International Visitors for more information. PagePlus, Virgin and Boost are CDMA and you would need to buy one of their phones to use them. Simple mobile definitely deserves to be on here also. GSM carrier with $40 unlimited talk/text, including global text, and $50 for unlimited talk/text/2G. Could you also compare PlatinumTel? I'm planning on reviewing both Simple Mobile and PlatinumTel in the new future. They are both over very good pricing and are fairly new. I seen a few people complaining of a 2GB data cap on Simple's Unlimuted plan but other than that users seem to like both services. PlatimumTel uses the Sprint network, Simple uses T-Mobile. Neither allow any off network roaming. Could you point me a link or direction to "AT&T MVNO H20 Wireless" prepaid plan? I could not find any where including AT&T web site. Yeswap, What are the options i have among the MVNOs if i have an iphone 4S and need a verizon network in my area? I heard that pageplus blocks iphones? What about android phone and verizon network? All Verizon MVNOs block iPhones. Android phones are OK.
What about Sprint MVNO's like Platimum Tel? Do they block iphones too? Sprint MVNO's BYOD is very limited. Sprint supposedly doesn't permit it and PlatinumTel doesn't allow it. ZappUnlimited.net claims they can "usually" activate any Sprint phone. Haven't tied it and I'm a bit wary. If you do try Zapp be sure any phone you buy can be returned in case activation fails. Also there is no data available on Zapp PAYGO. To get data you have have a Zapp Unlimited plan. If I were to get the new Samsung Galaxy Nexus phone, which is the new android 4.0 operating system and designed to take advantage of 4G LTE networks, is there a reseller you would recommend? There are no resellers with LTE at this time. The only US model of the Galaxy Nexus that's been announced is the one for Verizon. It will probably work on Page Plus if you remove the LTE SIM, but we won't know for sure until someone tries it. Of course you won't get LTE speeds that way, only Verizon itself can provide that and I don't think they will activate any LTE phones on their overpriced prepaid smartphone plans. The unlocked GSM version will work on AT&T and T-Mobile and their MVNOs but doesn't support LTE. T-Mobile's HSPA+ is 4G and pretty fast, though Verizon LTE is faster. so if you were to get this new phone, perhaps buying an unlocked version in next few months, and your goals were: 1)Ice Cream Sandwich (android 4.0) experience, 2) inexpensive phone/data plan, 3) speed of network that would take advantage of said phone's capabiiities, what plan would you gravitate to and whY? thanks. Yeswap, so overall what would you recommend. I want good service and decent internet for like navigation apps. Im contemplating between t-mobile or page plus? I'd get the GSM version and put it on the T-Mobile $30 5GB, 100 minute plan or if I needed more minutes the $60 or $70 unlimited plan. Where I am T-Mobile has the fastest and cheapest pre-paid data. AT&T is also a good choice with $25 data feature packs and whichever voice option (PAYGO, $25 or $50 Monthly Plan) works for you. thank you Yeswap. I am told by a friend who works for T-mobile to expect this phone in Feb or March, so... that is likely my wait. Any suggestions of a couple of places other than ebay to find this phone in the next month unlocked? First of all Zapp is gone...dead out of biz, second AT&T is trying to get rid of all its MVNO's, they started to charge them for international text, while on their own $50 unlimited plan its free, so its actually cheaper to go with the network owner than its MVNO. I'm unable to confirm that Zapp (zappunlimited.com has shut down. Their site is up and there are no complaints from users on Howard Forums or ACRS (Zapp Master distributor) Forums. All the AT&T MVNOs lost free international texting at the same time so AT&T probably is to blame. AT&T MVNOs are no longer competitive for plans that include unlimited voice, messaging and international SMS. Walmart Family Mobile is postpaid, not prepaid. My Zapp PAYGO phones are alive and well, thank you. There is a problem with Zapp's days-of-use counter: it erroneously counts down from 180 days, not the 365 day term offered by the PAYGO plan. When the counters on my three lines reached zero, service was suspended and I had to phone C.S. on another line to get it back. While I did not forfeit any money/minutes or phone numbers, the need to do this for three lines prematurely expiring on different dates has been a nuisance. This counter bug has been experienced for a long time by Zapp users and was acknowledged by Zapp correspondence with me in Sept. 2011. At the time of my suspended service conversations with Zapp C.S. in mid-Feb. '12, I was told that the website is in the process of being revamped to reflect that Zapp is changing to "a new system," for whatever that's worth. The phone service is reliable. With the Unlimited Talk n Text plan's teething pains past, C.S. is prompt, courteous and...domestic. The Verizon-sourced service itself is nearly flawless, thus, I only need to call C.S. to change features (shut off data, for instance) or port numbers. Don't base your opinion of Page Plus on reviews from a couple years ago -- look at recent reviews and the Verizon Prepaid coverage map. It's hard to beat reliable VZW service for a minimal $30 a year, and the ability to use most off-contract VZW phones. I agree. I have had PagePlus for a couple of years. my trusty "drop on the ground" samsung work phone. And my New HTC Trophy WP7.5 smartphone. I have saved a ton of money useing PagePlus, it works for me ! Thank you very much for compiling this very informative and helpful page. I have 2 LG290C CDMA phones. 1 is on TracFone the other Straight Talk. Can they be activated on Page Plus? No Tracfone and Straight Talk phones will not work on any other carrier. Wish that the tables included Tracfone as well. Their PAYGO rates with the DMFL and TMFL offerings with bonus minutes promo codes way beat the standard .10 min Sprint and AT&T MVNO's. why you don't list/recommend H2O Wireless? It is as good as (if not better than) REDPOCK. I used to recommend them until I started seeing multiple reports of H2O users getting kicked off without refunds for "abusing" unlimited data, voice or messaging. Also H20 keeps changing plans and policies with no advance notice. Over the course of a few months the $60 plan went from unlimited data to 3GB to 2 GB to 1 GB to 2 GB with a 500 MB soft cap. The 90 day expiration on pay as you go became 30 day with no advance warning and no grandfathering. To keep the post to a manageable size I only want to include one non-Tracfone AT&T MVNO in each category. Red Pocket seems a little more consistent and their monthly plan pricing is as good or better than H2O. On pay as you go, Airvoice has comparable rates and much better customer support than H2O. I went to the local T-Mobile store today to pick up a SIM activation kit and was told they could not sell it without attatching it to a plan. So, I ordered one of the website and will give it a try when it gets here. I bought the Nexus from Google directly -- and made 3 calls with Talkaphone and my GV account over WI-FI. Have yet to install a SIM - as I Have been looking for the right deal. Have a Sony Experia pro GSM. I only talk about 300 mins a month and do not text. Have wifi, no need for data plan. Which plan best for my situation? Since you're only interested in 300 voice minutes per month, I'll assume there's no difference in your case between the North American (MK16a) or International (MK16i) versions of your handset (each supports GSM 850/900/1800/1900). - Airvoice Wireless: $10 PAYGO/250 mins/30 days, which averages to $12 per month (coverage appears to be AT&T GoPhone Prepaid). - H2O Wireless: $10 PAYGO/200 mins/30 days, which averages to $15 per month (coverage appears to be AT&T GoPhone Prepaid). - Consumer Cellular: $20 Anywhere300 (only included this because coverage appears to be AT&T Mobility postpaid; drawback is that these accounts require credit card autobillpay). I agree with these recommendations, particularly Airvoice, which in spite being called a monthly plan, is really a true pay as you go, minutes roll over and you can refill whenever you are running low. H2O is also pay as you go with rollover but price is higher and customer support is not as good. I do have a question concerning a Prepaid Unlimited Text Plan if you please. Concerning PagePlus's PowerText plan...Is it possible to take my existing Android phone and attach this to the PowerText plan for $15/month and just pay the $.04-.10 per min talk and the $.99/mb data whenever needed? Many thousand texts may come in/out but almost no minutes of call time & extremely limited data usage.If this option is viable then that would be a very tempting deal for my situation. You can use any clean-ESN Verizon postpaid Android phone with Page Plus. PowerText plus the Standard plan for calls sounds perfect for your needs. This is all extremely informative, thanks for the summary. However, I just was given an android (5 days ago) and am on Verizon month at a time. Is there any service available for just talk & text and no data? Also, when I first got it (it had been actived but discontinued contract when relocated months ago)I could surf the web and was also getting gmail as long as I was near a wifi source. How? If your Verizon Android phone has a clean ESN (not "blacklisted" for non payment or the early termination fee or because it was reported as lost or stolen), it can be activated on Page Plus' Standard plan and used for talk and text only. Just be sure to turn off mobile data on the phone or by calling CS as data on the Standard plan is costly. Wi-Fi should work without mobile data or even without any cellular service at all. 1: Using a (usually manufacturer supplied, such as Motorola RSD or Nokia Phoenix) PC program to re-install the phone OS with the same or a different one to recover a non-working phone, update to a newer or custom OS or, with feature phones, to give the phone a different carrier's custom OS. 2: Using a 3rd party PC program like CDMA Workshop or QPST to modify hidden settings in a CDMA phons so that it will activate and work on a different carrier than the one that it was intended for. This often involves changing the phone's ESN (electronic serial number) which is a legal gray area. Great! That cleared up so much that I have been unable to get a straight answer to. I am going through your other articles (as I locate them) for other questions rathr than tie you up here. I have already turned on a number of my likewise 'challanged' friends to you. Thanks so much for sharing your knowledge, especially in such an easy to understand mannner. Keep up the good work! I was looking for only prepaid voice plan. No data and no text. Which provider would be best suited for me since I want the lowest price, but also want my minutes to rollover after 90 days. Depends on how much talking you do and which network you prefer. If you use less than 250 minutes/month PagePlus, Airvoice and PlatinumTel all have rollover and voice rates in the 4-5 cents per minute range. See the "Best Pay as You Go Deals" table in the post for the details of each. The lowest voice price is 4 cents/minute on PagePlus using the $80 refill which is good for a year and rolls over and runs on the Verizon network. I use less than 100 minutes a month since I only used the phone for emergencies and transportation home. Plus I'm still trying to find a real job instead of being a temp worker. Is anyone else having trouble with their (no contract) Verizon $50 per month unlimited talk, text, and web? The email app expires. Every month since February, 2012, I go to my local Verizon store to have email reinstalled on my cell phone. Why don't you mention my simple mobile? We recently returned stateside after living overseas for a year with 4 unlocked GSM phones and do not want a plan. We have used my simple $40 talk, text, and data for the last month and have had no problems. Since we have old phones, I don't use the data and would rather have just talk and text for about $25 but can't find it. My only other question is do you know of somewhere to get a break on 3 phones; I want to have another line for my child and not pay an add'l $40/month. Just talk and text unlimited ultra mobile....30 per month. liberty wireless 20 per month. Interesting about the Airvoice plan. It's very hard to find directly from their website (it's not listed under their pay, but the link in your article goes there). I mistakenly went to the site and clicked on the pay as you go option and the plan listed there is very different ($0.10/minute and $0.10 per text). Your link works and goes to a different plan though. There are two Airvoice pay as you go plans. The legacy "Pay as you go" plan is 10¢ per minute, 10¢ text with 90 day expiration and a $1/month 911 fee. The "$10 Plan", which is new this year, is 4¢/min, 2¢/text with 30 days expiration and no monthly fee. It's linked off the home page "Plans" drop down. I like that Airvoice has both plans, the 90 day one is good for low usage, low monthly cost "glove box phone" use and the $10/month one is a great deal for anyone whose usage is in the 200-500 minute or 400-1000 text per month range. All the plans listed in the "Best Prepaid 250-1200 Minute and Texts Deals" table above are still available. Those would be the cheapest for your usage. Do you know if AirVoice has automatic renewal on the $10/month plan? As far as I know Airvoice doesn't offer auto refill on any plan. Since AirVoice doesn't offer auto refill, then will I get reminders when I place a call that I need to refill when it comes close to my expiration date? Also, based on my understanding, Pure Talk does offer automatic renewal on its $10 plan right? Another question: Is it possible to turn off balance notifications on H2O Minute Plan. And last question: AirVoice Pay as you go says that $100 buys you 1200 minutes. Is the 1200 minutes after the $1/month 911 fee or before? Starting 5 days before balance expiration, Airvoice will play a warning message before your 1st outgoing call of the day. You can also dial *777# at anytime to view your balance and expiration date. Auto-pay is mandatory on all Pure Talk plans, no other payment type is accepted. On AV PAYGO it's 1200 minutes before the $1/mo fee on the $100 topup. Which would you recommend, AT&T GoPhone, or TMobile Prepaid if I live in the Bay Area in terms of coverage, voice quality, network traffic, and features? I find T-Mobile as better call quality and faster and more reliable data and roughly equal coverage in San Francisco and the South Bay. AT&T has better coverage in northern Marin. 1. I will be visiting Dallas in TA and New York in NY. Howz T-mobile connectivity there? 2. How much minimum do I need to purchase to get waiver of $10 SIM/Activation fee? 3. Since International calls/texts are very expensive (standard rate in pay by the day plan), is there any top-up which I can use for making international calls/texts. If no top-up is available, request you to please suggest an alternate plan. Needless to say, i want to keep the costs as low as possible. P.S. : I may have to call 112(for less than a second) after inserting a new sim in my Iphone. Is that illegal in US? 1. I have no personal experience with T-Mobile service in New York and Dallas. I expect that it's adequate. 2. The $10 SIM card fee is waived when activating on a $30 or higher prepaid Monthly plan. 3. International texts are 10¢/each on the $2/day plan. In the US 112 redirects to 911 and calling 911 for anything other than an emergency is illegal. Supposedly the Gevey 112 call is so short that it never registers as a call to 911. If the call does connect and hang up, an emergency operator will call you back and you will need to take the call and explain that you dialed 911 inadvertently. Thanks for your answer above. Which calling card you suggest for international calling. Considering that I may not use even 100 mins during my stay, what would be the minimum denomination that I can buy? Also, will the access numbers of calling cards be charged by T-Mobile even if I take $2/day unlimited calling and text plan? I can't recommend a specific calling card as there are hundreds of them and you are only likely to find a few brands in any given store. You do have to read the fine print carefully. Avoid cards with high per call connection fee or additional charges. The minimum card denomination is usually $10. As long as the access number is a US based one (it always is for cards purchased in the US) you wont be charged extra by T-Mobile. Which offers better coverage, Page Plus or Tracfone on the Verizon network? I know that Page plus is the same as verizon prepaid, and they charge for roaming. Does Tracfone charge for roaming? I heard from somewhere that Tracfone uses the postpaid network? Is this true? Does tracfone charge for roaming? Tracfone has slightly better coverage than Page Plus. Tracfone doesn't charge extra for roaming and roams on a few small regional networks that Page Plus doesn't. I thought so but was not sure. I was with Page Plus and moved to a Net10 Proclaim phone for the savings. I found that there were areas that I now had coverage in that I was not getting with Page Plus. Less money and better coverage, I guess that's a no brainer if you can live with the Samsung Proclaim. Interesting. I din't think Net10 Unlimited on Verizon roamed. Straight Talk on Verizon definitely doesn't. The phone itself is not roaming. I travel alot for my job and had problems in South Central Wisconsin with the Page Plus coverage (Although PP offers roaming service in that area). My Net10 phone is getting very decent coverage in the same area. Which carrier has the best coverage in the SF Bay Area? Since T-Mobile roams on ATT, does T-Mobile have coverage whereever there is ATT network coverage? And since Sprint roams on Verizon, does Sprint have the same coverage as Verizon? If so, why would people pay more for Verizon and ATT if Sprint and tmobile offer the same coverage? Does CDMA have better reception/indoor coverage? T-Mobile doesn't roam in its native markets like the San Francisco Bay Area. Refer to the T-Mobile Prepaid coverage map to see where roaming (labeled "partner") is supported. In my experience T-Mobile and AT&T coverage in the SF Bay Area is roughly equal but T-Mobile has better data speeds, better voice clarity and fewer dropped connections and calls. Is it true that Att and Verizon's lower frequencies have better building penetration. 850 Mhz, which AT&T and Verizon use in most areas, theoretically has better in building penetration than the 1900 Mhz used by Sprint and T-Mobile. However good network design and optimization can overcome 1900's theoretical deficiency. Sorry for the bother, but I read online that some places have ATT coverage but not Tmobile coverage because Tmobile doesn't have a roaming agreement with ATT in that area. Why does Tmobile not have roaming agreements in some places, but it does have them in others? WOuld the Tmobile coiverage map be accurate for those places that don't have roaming agreements? Would if be unsafe to use Tmobile if I traveled a lot and were to get lost in the middle of nowhere while traveling or something? T-Mobile has top pay the roaming party for the calls and messages its customers make while roaming. They only have roaming agreements where they are cost effective. Yeswap, I want to leave metro because theyre coverage is really bad. And im contemplating in between page plus and t-mobile. Who should i chose? I mainly want good service and good internet for navigation apps or quick look up on google. But mainly good service. Can you help me out bro? You should first look at whether Verizon and T-Mobile has coverage in the areas where you will be using your phone. If you have coverage in your area both will work well navigation, maps and the web. T-Mobile pluses - faster data in most urban areas, lots more flexibility in switching phones. Page Plus pluses - more coverage overall, data that's fast enough and works almost everywhere, slightly better customer service. Page Plus minuses - limited choice of phones (only Verizon non-LTE, non-prepaid phones will work without a lot of hacking). Yeswap, Thank you, I live in Corona Ca which is southern Ca. Im so sorry i ment to put boost mobile not t-mobile. Theirs coverage in my area in both I believe. So what would you personally chose? Is page plus a safe bet or the whole limited data a bummer,I l know boost has unlimited web. Either should be fine in Corona proper. If you travel check the Verizon and Boost coverage maps. See Coverage Maps For All Prepaid Carriers for links to the maps. Page Plus data will be faster. Boost has unlimited data but Page Plus' 2 GB should be plenty for just navigation and browsing. Thanks a lot for your help sir, God bless. does page plus support verizon good esn iphone? Page Plus official position is that it does not allow Iphones on their network. However there are a number of people who are doing it. As longt as it is a verizon iphone, it will work. Is a shared plan comparison in the works for light users (<500 voice min. & texts, no data)? Or would 2 or 3 prepaid plans be the best option for price, coverage (Cincinnati) and roaming? Postpaid family plans (not AT&T and Verizon's new Shared plans which include data) can be a better deal than prepaid for families and groups of individuals. It's impossible for me to make a general comparison. Determine the maximum number of minutes and texts per month your group needs and crunch the numbers. Be sure to include postpaid taxes and fees which can amount to 15% to 35% of the base cost. Taxes on prepaid are low or non-existent. I have no experience with coverage in Cincinnati, but all carriers should have decent coverage for voice and texts in such a major city. Great topic. Thanks. Although it's postpaid, Walmart Family Mobile on T-Mobile has no contract requirements. At least on the legacy plan the price is $45 + N*$25 with no additional charges for data (at least at the speeds and data volumes we use). Not an option for new customers,though. Calls to Mexican mobiles are 5¢/minute with the Boost International Connect add-on plan. Thanks, but the Promotion of BOOST MOBILE Calling a Mobiles Mexico 5 Cents x minute EXPIRED,I talked a Rep. Sales of Boost MOBILE, But TEXTING is free Sending/Receiving with Plan $45 and International connect $5 Dlls. Are you saying it's false advertising? Do you have the $10 international plan and you are being charged more than the advertised 5¢/minute for calls to all Mexican mobile phones or some of them or what? Is false ADVERTISING? After I set up or Signed with Boost Mobile, I Called Boost Mobile Central office and asked: if my plan Could Call a Mexican Mobiles(Movistar,Telcel,Unefon etc..)at the price Minute 5 cents;;The operator told me: "That Promotion is Expired" She changed my international connect plan to $5 dlls month,but this change will be next month.because I paid..I have Now the $10 Dlls.international connect plan, but the rate is different from the website. Since my wife needed a new phone I went looking for another Straight Talk phone, but they didn't have what I wanted so I switched her over to Net10's unlimited plan, which also costs $45 per month if you auto pay with a credit card. Her previous phone and this one were on the AT&T network, but she seems to be getting better service in some locations with the Net10 version. I can only conclude that is because Net10 is allowing her to roam when there isn't good AT&T coverage. WhatsApp Messenger: WhatsApp is an alternative to SMS and MMS, that works via the Internet, thus avoiding any charges that normal messages incur.Chat with your friends all over the world as long as they have WhatsApp Messenger installed and avoid those pesky international SMS costs. The WhatsApp is good option for Heavy texters and International people,because if you Samartphone not have Internet Data, but you smartphone have WIFI,you can use FREE Hotspot or your "Home WiFi" to be connected or available in WhatsApp. Excellent information. I have a question regarding the plans for low voice minute unlimited text-data plans (i.e. Virgin Beyond Talk). We hardly use any minutes per month but do a lot of texting and data use. But we do call internationally (Ireland and sometimes Spain) once or twice and certainly text them several times per month. Is it still cost effective to choose one of these plans rather than the post-paid plan and which would be the best deal? THANKS!! I suggest that you use an Android phone with either the Beyond Talk Plan or the T-Mobile $30 plan and use the free Google Voice app which will let you make international calls very inexpensively, 2¢/minute to landlines in Ireland or Spain, and use email instead of text where possible. Unless you send hundreds of international texts per month those two are probably the best for heavy data use and light international calling and texting. I have straight talk service. I want to port my # to page plus. Here's where it gets tricky..I used all of my $ on my straight talk plan so that I didn't loose anything. I am trying to add my LG Optimus phone and ph# to page plus. In order to port over, do I need to have an active phone on straight talk for it to work? If your plan month ended recently you should be able port. Don't wait very long. Straight is supposed to keep numbers 30 days but I've heard they some times reuse them sooner. Ugh.....sooo much great information! Almost too much to take in at once..lol. like many moms this year, I will be giving my daughter (10 yrs old) a cellphone for the holidays....we don't have a land line so she needs one just in case. She is not a big phone user, not many friends to talk with, but I want to be prepared with the right plan so I don't get an outrageous bill one day... soooo.... I am a former boost customer. Knowing they are with sprint, ans sprint seems to be the best covered carrier in our area (tristate california, arizona, nevada) I thought about them. Then. I walk into our walmart store...and the all knowing cell guru guy recomends family mobile plan from walmart, powered by tmobile. $45 a month, unlimited talk text & web ...and is a post paid service. Payments can be made at walmart, by phone or auto pay. I'm still on the fence over the two....I have tmobile and it doesn't always have good service in my area. Mr. Yeswap, Do you know any info I should consider when making a decision between the 2? I always recommend choosing the carrier that gives you the best coverage first and then picking a phone and plan that works with that carrier. If Sprint works better than T-Mobile in your area go with a Sprint based prepaid carrier. Boost is a good choice but if you don't need unlimited minutes consider the Virgin Mobile (also owned by Sprint) $35 Beyond Talk plan which includes unlimited data and messaging and 300 minutes a month. Pageplus is the best had boost mobile before was just terrible I have an iPhone 4 on pageplus paying only 29 dollars now that's a deal!!! New Airvoice plans are very competitive. $30 Unl TnT; $35 with 100 MB; $40 w/500mb. Pageplus only gives 200mb with their Unl TnT. H20 Wireless just announced a $30 Unlimited TnT. I saw that and updated the Five AT&T MVNO's Compared post to include the $30 Plan. I just added Airvoice's $30 plan to this post. Airvoice seems to have better customer support and get fewer complaints than H2O and is thus more deserving of the "Best" label. There are so many choices now, with so many rate break points that it is getting hard to compare plans. These charts are very helpful. To estimate total costs, I compared 14 companies using equal numbers of voice, texts and data, my long-term pattern. I used 100-100-100 up to 500-500-500 in increments of +100 each. 14 companies X 5 rate tables. Results? Two companies scored win, place or show in 4 of 5 samples. - Ting had the lowest total costs after adding the price for all 5 samples, $147. This is because their low use sample was half of Straight Talk at $15 vs. $30. - Straight Talk was next lowest, at $150. They would be lowest after gov. taxes that Ting adds. One company, Pageplus won, placed or showed in 3 samples with the 1200 TnT plan. $160 total. One company, Ultra won, placed or showed twice. Total cost $161.20. Three companies, Platinumtel, Spot and Virgin iPhone plan scored once. Total prices ranged from $180.50 to $206.50. Highest total price was Pageplus 'the 12' plan at $350. Most people will switch to 1200 TnT as their usage increases. Next highest were H20 at $235, and Tmobile and PureTalk tied at $220. Data cost was a key driver in this analysis. You can change the rankings significantly by increasing or decreasing data. Data use is increasing, so we see many MVNOs scrambling to increase data in their monthly plans and reduce PayGo data rates to stay competitive. Nice analysis. This is similar to the final step of the process I recommend to anyone looking to find the best prepaid operator and plan for their needs. 1. Determine which networks (Verizon, T-Mobile, AT&T, Sprint, etc.) provide the coverage they need. 2. Determine their average and maximum monthly usage of minutes, messages and data. Run the numbers like you did but for one's actually usage and only for operators that run on the networks they use. Thanks for your summary. Do you know rates of international calls for Air Voice $10 plans? I don't. Airvoice internatinal rates aren't published anywhere. Call Airvoice customer service at 1-888-944-2355 tomorrow (they're closed Sunday). Ptel's new plans deserve consideration as 'best,' I think. Especially the $50 plan with 2GB fast data and unlimited slow data after that. PTel (nee PlatinumTel) also deducts a $0.50 maintenance fee from your account each month; please update the Pay As You Go table. "Accounts are billed a $.50 monthly fee as a contribution to Federal Universal Service Fund and WLNP (Wireless Local Number Portability)." It does say that. However I think that fee is no longer charged on the GSM service. The Terms of Service page doesn't look like it's been updated since the switch to GSM. It uses the old PlatinumTel branding and still shows MMS as 10¢ on PayGo although they are now 2¢. Are you on PTel GSM PayGo? Have you been charged the 50¢ fee? I have been on GSM Ptel since 1/3/13, and have not been charged the 50c fee. I have Verizon iphone 4 with contract already expired. I need around 500 min, some text and little data to check e-mails. Which of these prepaid or any plan that will be best for me. Please advice. Thanks. Yeswap has done all the hard work for you. http://www.prepaidphonenews.com/2013/02/verizon-and-verizon-mvno-prepaid-plans.html to find the plan that is best for you. Texting: We use iMessage/WhatsApp for almost all texting. I'm in dilemma as to which phone and plan to go after: Vonage/PagePlus/StraightTalk? Straight Talk $45/month - umlimited calls, unlimited domestic texts and "unlimited" (approximately 1.5 GB) of data. If you need less than 300 minutes per month, the Virgin Mobile iPhone with $30/month Beyond Talk plan (using credit card for autopay) gives you unlimited data, and you save $100 on the iPhone. When you use Vonage at home, the free Vonage Extensions app lets you use your home plan on the iPhone. You can make calls over WiFi or 3G/4G. People in India do not have to have Vonage at home or have the Vonage phone app installed for these calls to be free. If your wife also wants the iPhone to work in India with a local SIM card, she should buy the unlocked AT&T or the Verizon iPhone (which has an unlocked SIM slot). The Virgin iPhone has a locked SIM slot, so it will not work in India. The Straight Talk Verizon iPhone reportedly has an unlocked SIM slot, so it also would work in India with a local SIM. Kajeet $14.99 unlimited sms, 60 minute voice is a $5-20/month lower price than any of the heavy texting plans listed here. They support BYOSD and have data add-ons for $4.99, 50mb, or $9.99, 500mb. Much better data pricing than Verizon or AT&T. True, although the savings are a little less because of Kajeet's 10% surcharge on airtime purchases. I've added the Kajeet $14.99 plan to the post. The Page Plus Standard Rate Plan link does not work. I do not find any plan for $2.50 on their site. Oops, Page Plus redesigned their site and most of the links broke. To find the Standard Plan, go to the main plans page and scroll to the Pay As You Go plan at the bottom and you should see the $10 good for 120 days option, which is about $2.50/month. Yeswap, is there any reason why PTel would not want to keep Sprint service? (and also offer T-Mobile), when I called them they seemed to think they were doing their customers a favor by dropping Sprint for T-Mobile. I'm happy with Sprint on PTel and don't want to mess with buying a new phone. It's hard to say but I can see where it would be more costly to maintain billing, activation and support for two incompatible networks. Their CEO says they can now offer customers a much wider choice of attractive GSM handsets, and lower-cost monthly plans. The Ptel GSM plans cost less than the Sprint Android ones. I suspect they would also had to face much more MVNO competition under Sprint, and invest money to handle BYOSD activation. BYOSD customers would call CS for tech support whether Ptel provides it or not, so Ptel would have had to add CS employees or make customers wait even longer than they do now. This prepaid GSM comparison article is a little out-of-date because it does not have all the latest plan changes, but there is still a lot of good info here, especially the comparison of international long distance. I activated a Droid phone (older model from 2010, and first active on Verizon, but no longer so) on Page Plus. Two issues I've experienced for the past few months will probably have me ditching Page Plus' service. First, I used the plan for data service, it did not work. It only accessed the internet via WiFi. Page Plus Customer service then informed me that they could only guarantee internet access on phones purchased through them, and that they were aware of the issue of phones previously active on Verizon, that is - not being able to access the internet via the Page Plus service, and only doing so via WiFi. Would have been good of them to state that fact before I blew some cash on that plan. In addition to that issue, the phone does not always receive calls. I've experienced several times being near someone, having them call me, and the phone does not register any incoming call; neither does it go to voicemail. Nothing, nada. And it does this at the most critical of times. A definite fail. Not cool. Hope to find another CDMA prepaid serving NYC that is fairly economical and DEPENDABLE. If you register for the user Forum at kittywireless.com, the helpful members will explain how to get internet working on your Droid. Many of them use Droids without the problems you had. They can also help you troubleshoot your calling problem. If they cannot help you fix the issue, your Droid may have developed a problem. Sounds like a phone I got. I returned it. - AirVoice data *** could use a footnote. - Virgin PayLo and Straight Talk $30 - no smartphones, I think. Thanks, I've made the corrections you mention, except for Airvoce where I don't understand why a footnote is needed. Oops. I should have typed AT&T *** data column. PTel "Real PayGo" with 5c/minute, 2c/txt, 10c/meg needs to be on the pay as you go chart. Air voice now offers auto refill option. They started this feature since last month. Wow!!! You guys forgot Ultramobile and SpotMobile. They use T-Mobiles network but the rates are great. I would say Airvoice Wireless (AT&T MVNO) is the best for coverage and domestic customer service. Airvoice has the cheapest light user plan at $10.00/month as well. Ultra has the best $29 plan around, and ILD rates I have seen are best. They also include data for their $29 plan. No other carrier except for PagePlus which is CDMA gives data at that price range. PagePlus which is CDMA lacks any decent international long distance plans. They also do not have international SMS or MMS I would not pay $1.50/min flat rate for an ILD call. SpotMobile has the cheapest unlimited Text and Talk at $24.99. Everyone needs to shop and compare. Lyca $19 plan is less than Spot $24.99 if you shop. The AirVoice $10 plan is on the list. It is really prepaid (read how it works). The Lyca $29 plan is better than Ultra's if you use data. Compare them. Spot has very poor customer service. E.G., it took them over 3 months to reset a PW. They kept blaming their developer. They could not delete the acccount, either. Their pw reset messages still are not delivered; my ISPs delete them. If you do not use your phone every 60 days they cancel it. They are losing so much money and so many customers they may go out of business soon (read their financial report). The $10 Airvoice plan is the best light user plan available. Try calling Lyca's CS and you need more patience than the late Mother Theresa to understand them. Spot is a hit or miss. Shame when they changed their network platform. That's when they started to go downhill. Ultra knows what they are doing and will keep updating their plans as time goes along. Plus their ILD has the best rates of anyone. Ptel is much better overall than the AirVoice $10 plan if you want to use mobile data (10c vs 33c/mb), and the monthly minimum is half ($5 vs $10). Compare. Ultra still hasn't released Pay-Go after promising it 6 months ago, and still won't sell you 500mb for $10 on the $29 plan as advertised. Good luck with the overseas tech support. Lyca is not executing well; Dennis tol us the $19 and $29 plans were limited promos on April 1, and my SIM has still not arrived. Ordered and confirmed March 20. I had H2O for over a year now and haven't got any problems with them even though heard complains. I think H2O is one of the main MVNOs and should be recommended. Whatever 'unfairness' they commit, same do the other MVNOs as well. H2O's support seems to have gotten better lately. Which H2O plan are you on? I'm on the cheapest $30 plan, but had $40 plan. Works perfect for me! If I needed data I'd go Tmobile. I am in need of a recommendation for a new prepaid phone service. For the last three years I have used T-Mobile prepaid, but T-Mobile has somehow cancelled my account for the second time in a year (losing my minutes, remaining service time, Gold Member status, and reassigning my long-term number). I will never use T-Mobile prepaid in itself again - the company is just incredibly ill-managed (based on my personal experience). In short, I am currently in active duty military training. I call home once a week, lasting a hundred minutes each. When I return to the civilian sectre later this year, I will be working on the road as a technician; my weekly minute use may increase - but be no where near 2,500/month. I currently am in Texas, will be moving on to Ohio, and will likely stay in SE Wisconsin when I return to the civilian sectre (though I could move to IL if a job offer presents itself). When I heard that Lycamobile was offering a 2-cent pay-as-you-go plan, I ordered a SIM. However, given the experiences of others, the SIM may never arrive and I need cellular service yesterday (thank you, T-Mobile). I currently possess an unused CDMA Tracfone and a basic unlocked GSM phone. The pay-as-you-go Page Plus and AirVoice plans and $25/month Net 10 plan look appealing with 4-cent-per-minute voice rates given my usage patterns - any thoughts on which is better in my case? I am resigned to the idea of purchasing another phone to work on the carrier I choose. I'd just like to choose one that will fit my needs but also not convince me to look elsewhere soon thereafter. Airvoice has the advantage of a wider selection of more easily available phones (any AT&T or unlocked GSM). There main disadvantage is Airvoice's USSD balance update messages after every call text or data session, which many users find annoying and which can't be turned off. PagePlus has longer airtime expiration, lower minimum monthly cost and online account management. Hey Dennis, shouldn't Lycamobile have a "Minimum Monthly Cost" of 1/4 cent? You currently have $1.67. I guess you could round it up to 1 cent, and still be close enough. Maybe, Lyca hasn't been around long enough for anyone to test the limits of their minutes never expire policy. An outgoing call every 120 days is required to keep service active. If that's all that's required then the minimum monthly cost would be 1/2¢/month. You could correct the Table to show Talk4Good overage rate for data: 6c, not 5c/mb. Also, the Jolt Pay-Go page lists a e911 fee of $.99/month, in addition to the $1 monthly maintenance fee (listed in your footnote 3). The e911 fee is listed under Other Features in the Jolt Pay-Go webpage table. It looks like you only have $1.34 of your minimum $3.33 monthly cost available for use. You're right. I've corrected those errors. Thanks for pointing them out. Could you please also correct the first table for Boost Mobile? Smartphones starts at $55 per month. Data is not really Unlimited but is included and the Table shows No Data, Gracias! The table correctly shows the info for the $45 Unl. TnT plan. That's correct. This article is aimed at talk and text only users. For data-centric plans see The Best US Prepaid Data Deals. I am Juan De Lemos from Spain, I do not know to much pre-paid services in USA and I will be soon there, I wish already to get a USA mobile number and I am looking what will be the best, in Spain the prepaid services given the carriers are so simply you get the SIM card, you can get the SIMs in many places, Petrol Stations, Supermarkets, Tabacco Shops, well almost every where, you get the SIM, you insert the new SIM in a Unlocked phone, you Activate your SIM with the first call and after that you have already have a number without any kind of monthly feed or contrat, when you buy it already come with some credit in, lets say 20$, after when your credit is finish you still can recieve calls but you can not Call or send SMS, MMS, or get on line or any internet services, because of not credit in, but you can still keep the number for about 90 days still there is not credit in, after this 90 days you will lose the number if you have credit, you can have you number for 12 months longer if you have credit in, if not you need to recharge, and every time you make a call the carriers discount the amount of the call from your credit !!! My question is : there is something like that in USA ?? because I do read and see the tables and I do see that all have some monthly charge or monthly cost, Will you or will I lost my number if is not credit in, and the carrier can not get this monthly feed or monthly cost ?? Can you be on roaming with prepaid SIM ?? Can some one leave a message and tell me what from all carriers is giving something like that ?? My idea is to come for my 90 day Tourist Visa, may be I will need to get out of the USA and come back with 90 Tourist Visa again and I will like to have a USA mobile number and to keep it still I am back in Europe and of course still the people can call me to this USA number, till I do come back to USA !! 1. No minimum monthly cost: Lycamobile and Truphone sim. 2. Free incoming calls: None that I know about. 4. Don't lose balance or number if you do not top up: Lycamobile and Truphone. Just make a one-minute call or text every 90 days to keep your service..
Balance good for one year without adding more money, even if you do not make a call or send a text: Tmobile $100 top-up. 5. Roaming in the US: Truphone currently uses Tmobile first, and AT&T when Tmobile is not available. They just sent out new sims, and I am not sure it still works this way. Tmobile roams on AT&T in places where Tmobile has no cell towers. 6. SIM can roam while out of the US: Truphone, Tmobile. Check terms for the others. 7. SIM already included some credit upon activation: Truphone ($15). With others, you have to add credit separately at time of activation. 8. Receive calls and texts with $0 balance: None I know. Truphone might let you receive free sms (read their terms). 9. Receive calls in Europe, Canada, Mexico: Truphone. Check the terms or Frequently Asked Questions (FAQ) of Lycamobile and the others. Truphone lets you add a second UK or Australia phone number to the same sim for +$8/month; people can call you on that number too, and you can use that number to call when you are in Europe. I don't remember whether incoming calls are free to this number while you are in Europe. Suggestion: You should consider separating your data on one SIM and your calls and sms on another if you want to save money. Use two devices, or a dual-sim device. For example, when you are in UK, incoming calls and sms from Spain are free, and so is outgoing data. 2. Correction for #4 above: Lycamobile says make a call every 120 days, but I would do it every 90 to be safe. They are still changing their terms here as they get established. You could also check their terms for the sim they sell in Spain, to see whether it would work well for you here in the US (unlikely, but possible). ekit has not been reviewed in this blog. Add to #3 above: Lycamobile. Add to #9 above: Lycamobile. Incoming calls and sms are free when the USA sim is roaming internationally. I agree with the recommendation of Lyca, provided you can obtain a US Lyca SIM before you arrive. I believe that Lyca will ship US SIMs to Spain, which is a must as there are very few Lyca dealers in the US. Truphone and eKit are equally are to find in local shops here and Lyca is a much better deal than either for US use. Truphone found an extra $75m in venture capital and will use the financing to launch in the Netherlands, Hong Kong, Poland, Germany and Spain this year, more than doubling its international footprint. It will also increase its staff by adding 500 more employees over the next 18 months. This means its lowest rates will apply to all cellular calls made within those countries, and you can add a second number to your SIM for those counties. If you add the Tru app to your smartphone, Tru will automatically use WiFi if it is available, and depending on your plan that call may be free. been with pageplus for 5 months. have 3 lines. no dropped calls. online customer support is fine. love that there are no taxes to pay. You should include AT&T's 1,000 texts for $9.99, not just the unlimited option. I thought Airvoice's $10 plan would work well for my tween, until I discovered that mms are $0.10 each. (That would be nice information to include in your chart as well.) The AT&T bucket includes sms and mms texts, which is a pretty good deal ($0.01 each). Thanks for the great chart! Still would appreciate some more input if possible. I am looking for a new plan for my technically-challenged mother. She is a big talker but is on a limited budget. She is currently out-of-contract with AT&T and desperately need a new iPhone. My plan was to gift her an unlocked Iphone5 and put her on Lycatel. Luckily, I realized in advance that Lycatel is on T-mobile network which I know from personal experience, does not work well where my mother lives. Since she is stressed about going to an alternative carrier, I wanted to put this out there so this goes as smoothly as possible. I would like to get her on a plan that is under $50 which includes unlimited talk and text, data (100-200MB), and ideally, some international text and calling to Canada (as that's where I am!) I am looking at H2O, Smartalk and now Red Pocket which I just found on this site, thank you, but open to others as long as not on T-mobile. As this is for my mother, I do need to take customer service into consideration to some degree. Laslty, is an Iphone5 overkill for these prepaid plans? I never seem to understand what phones work best on what networks at what speed. Sorry for the lengthy message. AirVoice $35 and $40 plans including taxes and fees are good choices on AT&T. Excellent CS based in Michigan. For Verizon service, the PagePlus and Selectel $30 plans with 20-21.5 hours of talk may be enough. iPhone 4S for these plans. iPhone 5 is overkill for someone on a budget. 4S has two antennas and gets good reception. Used and refurbs go for $300-400, and you can get a one or two year warranty for small extra charge (get it). An iPhone (any model) is a good choice for first time smartphone users. Easy to learn and use with great support from Apple. Unfortunately there's a problem with iPhones and AT&T MVNOs like Airvoice, H2O or Red POcket. Configuring data and especially MMS is complex. To make matters worse, lately Apple has been sending out "carrier updates" which reset data and MMS to the defaults, which do not work on AT&T MVNOs. When that happedn data and MMS settings have to be redone. Verizon based options like PagePlus and Selectel don't have cost effective options for calling Canada. I'm not familiar with Smartalk, do you mean StraightTalk? StraightTalk and H2O have substandard customer service. If you buy an iPhone, I suggest buying a factory unlocked model, or getting a factory unlock. Our family has 3 refub 3GS models, and we have not been affected by carrier updates on AirVoice. Unlock also lets you set up MMS by just typing the addresses in the settings menus. CS will walk you through this, but their website has very clear support instructions. AirVoice CS is excellent every time. You can still unlock an iPhone that was originally sold before the Library of Congress policy cutoff date (Jan 26, 2013), and you also have no problem if Tmobile or AT&T give you the unlock code. Currently, there are places that will do this for as little as $5 if you do not qualify for a carrier unlock. Thanks for your quick responses! And yes, I meant StraightTalk :) Also my mom already has an iPhone3. It just doesn't work well anymore. Not surprisingly, she doesn't want to consider any other smartphone. As for the ATT prepaid option, I entered in my mom's number to see if she was eligible for the prepaid plan and they said she WASN'T and that she would have to get a new phone #?!? Is this an ATT ploy to keep her on postpaid? She lives in metro Philly. No where strange. Assuming I can get around this, how does the GO network compare to that used for the post paid network? Is it 4G? As for the MVNOs, I had heard about the MMS issue but didn't know it was also an issue for Data. My mom doesn't really do MMS but Data could be. Any idea of how often this needs to be reset? I had also heard that visual voice mail and the ability to surf while on the phone does not work with MVNOs. Is that also true? Gave AIrVoice a call. Seems like a good deal. They said they could walk her thru the set up (hope they have a lot of patience!) The only drawbacks I see, in addition to the potential MMS/Data reset, is you need to dial an access code to call internationally and it only works on a 3G network. So seems like iPhone 5 would be overkill even though It was going to be my birthday gift to her! If you have any reputable places to get a 4S with a warranty that you could share that would be awesome. Look forward to your additional comments if you have them. AT&T postpaid to GoPhone is considered a migration rather than a number port. AT&T can do it but you have to call rather than doing it online. Go Phone is 4G, including LTE if the phone supports it. Coverage is the same as postpaid except for no off network roaming. Roaming shouldn't be needed in and around Philadelphia. The data reset is something that just started happening last month. There were two or three carrier updates that went out a few days apart. Unfortunately no one seems to know if this is going to be an ongoing problem or if it was a series of isolated incidents. Airvoice support is first rate although they have relatively short hours and are closed Sundays. Data setup without MMS is pretty straightforward. You need to connect the iPhone to WiFi, visit a Website with Safari and click a couple of buttons. The best place to by a new iPhone 4S with waranty is an Apple store or apple.com, which also has refurbished iPhones. For used phones cowboom.com (owned by BestBuy) provides a 30 day waranty and is good about taking phones back within the waranty period if the buyer is unsatisfied for any reason. I had good luck with Mobile Karma for a refurb iPhone 3GS. They also offer a 30-day warranty and refund if you do not like the phone for any reason. They do not sell extended warranties like CowBoom, but currently have a better selection. If you have an unlocked iPhone, your data and mms settings menus are visible and you can just type in the settings without WiFi, Safari, or adding the profile via Internet. I'm surprised you can edit the data and MMS APN settings with an AT&T based SIM in the phone. Others with unlocked (not jailbroken) iPhones say they can't. Are you running an older iOS version? I edited the data and MMS settings using a Tmobile SIM in the phone. The menus appear. Then I put the AirVoice SIM back in. The settings worked fine. I am using the latest iOS. I have not been affected by Apple carrier updates. Yes that works. When the AT&T or AT&T MVNO SIM is in the phone the settings are hidden. Using a non-AT&T based SIM makes them temporarily visible. I'm looking for a plan to use with a gsm iPhone unlimited talk, text, and 4G web if possible; least expensive options? Are there any that aren't listed here? great table really helpful. I was wondering if you also had info somewhere as to whcih of the alternative providers can handle mms in addition to sms. I really should add MMS availability and rates. I will try to do in in the coming week. I believe that MMS should work with all the plans that have data with the exception of Republic Wireless and Lycamobile which don't support MMS on any plan. The 7¢ should be 0.7¢ for Lyca in the table for 7¢ minimum monthly cost is based on a one minute, 2¢ call every 90 days. The AirVoice data rate on the $10 plan is 6c/mb now. Where did you see it? I still see that the date rate is 33c/mb in AirVoice's web. I saw it on my phone screen after a data session. Dennis wrote a whole article about it on this blog. He has already updated the $10 plan data rate above. Would be nice if you could add a new table that shows ONLY those MVNO's and MNO's that include roaming (kinda like the table used in your "Walmart Family Mobile" post). Tmobile's new no-contract business plans are unbeatable, better than prepaid. $20/month for Unlim. TnT and data, with 500mb high speed. 2GB extra high-speed is $10/month more (each), or unlimited high speed with 2.5gb tethering costs $50/month. You have to buy 6 lines to get his price, but even if you only use 4 of them it saves you $40/month/line compared to 4 of their consumer or single business line plans. Business extras are available that make this plan even better.